Rahu and Ketu, the North and South Nodes of the Moon, are the most interesting and mysterious planets in Indian Astrology. In the group of planets referred to in Indian astrology, rahu and Ketu are considered as the only two planet is not worshipped as a god in Indian mythology. They do not own any signs, but they do own nakshatras. Actually in reality, the so called North Node Rahu and South Node Ketu are the North and South Poles of our Earth only, respectively. We are all the inhabitants of the planets Rahu and Ketu only. The strength of Rahu and Ketu when compared to other planets is very high by 1ØØØØØØ times or more. If Rahu is well-placed in a horoscope, it will bring power and material success. If it is not well-disposed, it can cause alot of problems. One may expect professional setbacks, loss of work and friends, and the possible break-up of a marriage during its major and sub-periods. Rahu is said to give similar effects as Saturnn. If Ketu well-placed, it will works towards providing knowledge and moksha, the final liberation from cycle of birth and death. A poorly disposed Ketu can also create total chaos. There may be monetary setbacks,personal unhappiness or a feeling of alienation, which can even result in withdrawal from materialistic life. It is said to produce the same effects as Mars. neurotransmitters and thier movement from brain to various parts of our body and back to the brain. level of our mind, but also the activities of hormones, blood circulation and function of the heart. pull of Rahu obsession and Ketu doubt teaches us the lesson of life so that we can liberate from this world and be one/merge with universes. 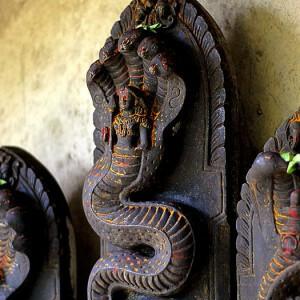 What is Naga Dosha caused by Rahu and Ketu? If Rahu or Ketu is in the lagna, 2nd, 5th, 7th, 8th or 11th house, it is generally said that Naga dosha accrues. - Ketu in the 2nd house called Aayurbhava Naga dosha creates longevity problems. - Ketu in the 11th house called Putra bhava Naga dosha causes progeny-related problems. Worship of Nagaraja is particularly important for those who have been named after Nagaraja for e.g., Nagaraj, Nagendra, Nagaletchumi, Nagaratnam, Nagappa, Naga sundram and so on. You can also chant his mantra for 1Ø8 times ‘Hmmm(Om) Nagarajaya Pothri’. It is said that one's present wealth, fame, health, confidence and merits will improve, obstacles and sickness will be eliminated, one will always meet good friends and masters, and have a happy harmonius family with pleasant looking and intelligent children when worship Lord Nagaraja. - Nagaraja is the deity bestowing progeny and family welfare. Perform Nagaraja pooja in your home by some learned priests. - Visit Rameshwaram, Devipattinam or the Navagraha temples around Kumbakonam with your spouse and offer prayers to the devatas. - Regular worship to Lord Ganesha, especially on Sundays and Tuesdays can please Lord Ketu. - Worships of Goddess Durga by lighting lemon lamps during Rahu kala, especially on Tuesdays has a great effect, which wards off evil caused by the malefic planets. In India - on Tuesday 3 p.m. to 4.3 p.m. In Singapore and Malaysia - on Tuesday 4.3Ø p.m. to 6.ØØ p.m. The best days on which the remedies for Naga dosha be performed are Nagapanchami day, the day before the Maha Shivaratri. Amavasai (New Moon) day on which the star Arudra, Swati or Satayam fall, tha Amavasai or Pournami (Full Moon) which falls on a Wednesday forming the Kalasarpa Yoga in transit, at the time of Solar or Lunar eclipse. I'm in a hinduism course right now but I have learned more from your stuff than anything I've learned in class. I am so grateful for all that IKS Academy team are doing for Hinduism.